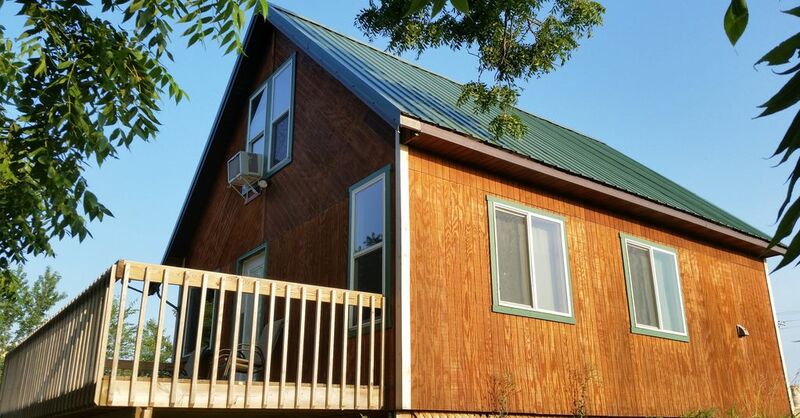 2 story 1 bedroom new construction cabin. Sleeps up to 6 people. Located on a small hobby farm. Beautiful view of countryside, farm animals, wildlife, and pond, 4.5 miles West of historic Kalona, IA with its Amish Settlements. 1st floor has full kitchen, living room with a queen size fold out couch, bathroom, and laundry room. Satellite TV w/DVD player. 2nd floor is large bedroom with 2 queen size beds. Roll away beds and baby beds available. Farm fresh breakfast provided on weekends. Mom / daughter get away. Aweome experience. Great seeing all the animals. Super comfy beds and living space, super clean, delicious bonus breakfast! Can’t wait to visit again! Was a great place to get away! Clean, comfortable and just right amount of ‘country’ to make you feel like you’re getting out of the hustle and bustle of city life. Family that owns the property is friendly and is close by if you need anything. Am planning on returning with my grandson to spend a weekend! Nice place. Grandson loved the animals and nature. We stopped here for 2 nights during our road trip. The cabin is very cute. The cats are very friendly and great us every morning as we were leaving and every night when we were coming back. The night skies there were incredible. Stay here to get away from it all. Also next door to the cute town of Kalona. Very laid back stay with amazing breakfasts! Great place to stay. Homey, comfortable, relaxing and full of character. Hosts were friendly, attentive and generous. Saturday breakfast was outstanding, and the meat and eggs from the farm were an unexpected bonus.